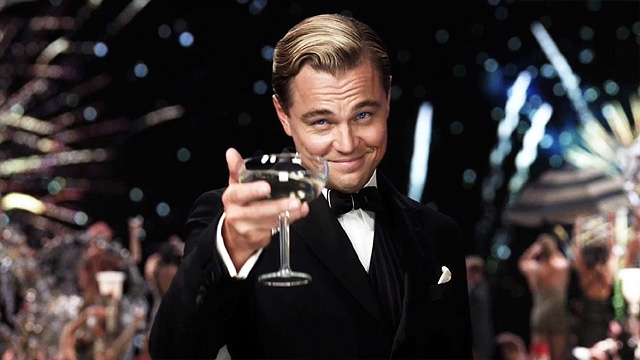 Gatsby raises his glass to the orgastic future. Adapting a book as beloved as F. Scott Fitzgerald’s The Great Gatsby is an unenviable task for any director, so I have to hand it to Baz Luhrmann, a filmmaker renowned (or notorious, depending on who you ask) for his visual pizzazz. The man takes on the challenge with zeal, and his adaptation positively throbs with wild enthusiasm for both the setting of 1920s America and the story of a mysterious billionaire struggling to win back the love of his life. The 1920s were not a time of great subtlety or moderation, which is good, because Luhrmann’s adaptation has neither. It’s a lurid, gaudy roller coaster of a film, at least for the first half, bringing to life Gatsby’s parties with the razzle-dazzle and acrobatic aptitude of a Cirque du Soleil performance. Awe-inspiring fireworks displays, streamers twisting and sparkling as they fall through the air, bubbling liquor as seductive as Greek gods’ nectar, all of it is visually magnificent. However, those scenes also never quite escape superficiality; any deeper exploration of the time’s loose morals and frenetic energy never truly materializes. That skin-deep trait is indicative of the film as a whole; as visually overwhelming as it is, Fitzgerald’s story is unfortunately left on the back-burner. Upsettingly, the author’s gorgeous prose is consistently cut up and paraphrased by screenwriters who seem to lack respect for and understanding of the book’s thematic and cultural significance. And the script is missing chunks of the story, especially where narrator Nick Carraway is concerned. Luhrmann is ultimately so concerned with creating a visually splendid adaptation that he doesn’t trust the source material to speak for itself, and so his Gatsby falls short of the greatness it seems close to grasping at times, a bitter irony in light of the story he’s telling. As the film progresses, it shifts from the garish party atmosphere to a darker, more intimate tale of adultery and betrayal as the characters collide in unexpected and ultimately tragic ways. Luhrmann flips a switch halfway through, and the sudden change is jarring. It’s as if he couldn’t decide which Gatsby to make – the decadent spectacle or the character-driven drama – and so he opted to make both. As a result, neither rings completely true in the finished product; the film is ultimately a beautiful but woefully inconsistent hybrid. What sustains Luhrmann’s overlong, overstuffed film are the performances of his all-star cast. Leonardo DiCaprio is pitch-perfect as the larger-than-life Gatsby, glowing with warm energy and charm. He sinks his teeth into every line with gusto, capturing the same vitality that Fitzgerald’s Gatsby symbolized to a generation. If Gatsby had hit theaters during awards season, I’d expect to be hearing DiCaprio’s name. He’s that good. Carey Mulligan is also terrific as Daisy Buchanan, the “golden girl” representative of money’s corrupting power. To Gatsby, she’s the green light, the American Dream he’s fought for his entire life. Mulligan brings her to life as a delicate, quietly vacant socialite, alternately trapped by and hidden within her shallow, materialistic lifestyle. We understand why Gatsby would fight so hard to reclaim her, but we can also see in Mulligan’s performance how she has been tainted by the decade’s atmosphere. As Daisy, Mulligan is both alluring and quietly devastating. Daisy’s brutish husband Tom is played excellently by Joel Edgerton, who toes the line between jockish arrogance and jovial nonchalance. His gruff, measured delivery does the character justice, never allowing Tom to cross the line into Bond villain territory. He’s a class-obsessed, suit-wearing sociopath, entertaining delusions of grandeur as he attempts to control the actions of everyone around him. Edgerton also excels by making him strangely sympathetic, a victim of his own social standing. Finally, narrator Nick Carraway is humanized by Tobey Maguire, who plays him as an innocent taken in by the atmosphere of the times but ultimately disillusioned with it all. His evolution from wide-eyed wonderment to jaded disgust is fascinating to watch, and there’s something deeply sad and beautiful in Maguire’s performance. Image Courtesy: Red Carpet Crash. This entry was posted in Reviews and tagged adaptation, carey mulligan, f scott fitzgerald, joel edgerton, leonardo dicaprio, summer, the great gatsby. Bookmark the permalink.